Freshman, Beca (Anna Kendrick), is persuaded to join The Bellas - her school's all-girl singing group. Along with an eclectic bunch of other new recruits, she injects fresh energy into The Bellas rather tired repertoire. Taking on male rivals, Barden’s The Troublemakers, The Bellas need to pull together if they stand any chance of making it to the a capella international finals. I’ve felt, this week, in need of some light relief. I wanted to watch a fun film that would make me laugh (out loud) and help me escape the craziness of life for a while. I thought that film might be Absolutely Fabulous: The Movie. However, while trying hard, this film didn’t quite hit the spot. In fact, I hardly laughed at all. This cinema experience made me wonder - when was the last time I laughed (I mean really laughed) at a movie? The answer? It’s been way too long. True laugh out loud comedies are few and far between it seems. As I made a list of those escapist films that make me laugh it hit me - I needed to watch Pitch Perfect again. I love Pitch Perfect and I don't (not that I should) make any apology for that. I didn’t have particularly high hopes for Jason Moore's film when it was released and then laughed all the way through. The energy in this film is contagious. I dare you to watch without at least (at the very least) indulging in some serious foot tapping. I always have such a great time watching Pitch Perfect and the casting of this film has a lot to do with my enjoyment. Anna Kendrick is superb as Beca. She really is a diverse and exciting actress. I love her interactions with The Bellas and the budding romance between Beca and Breakfast Club fan, Jesse (Skylar Astin), is incredibly sweet. Meanwhile, Rebel Wilson steals every scene as Fat Amy and Elizabeth Banks is utterly brilliant as Gail. Both share the script’s best lines and deliver them with perfect comic timing and flair. Those lines were written by Mickey Rapkin and Kay Cannon and are based on Rapkin’s book (of the same name). Gags and one liners fly off the screen, one after the other, and all hit their mark. You really do have to watch Pitch Perfect several times to fully appreciate the genius of the writing. However, what makes Pitch Perfect so enjoyable is the fact that the movie actually cares about its characters. It does not go for full on gross-out and it does not exploit its characters for cruel laughs. 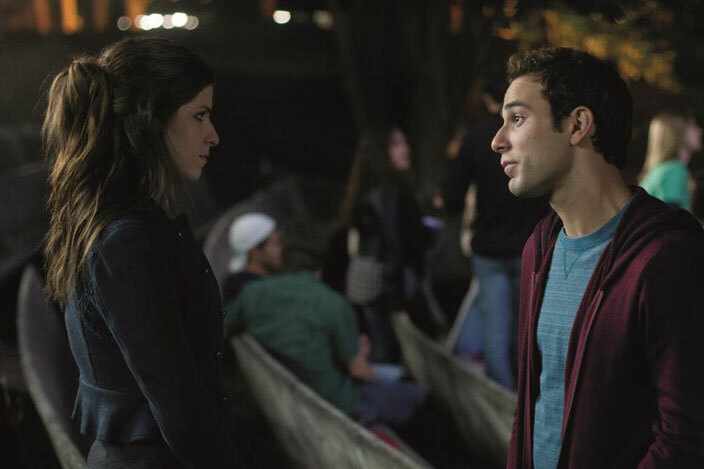 At the heart of Pitch Perfect is, well, heart. Since its release in 2012, Pitch Perfect has become something of a cinematic rarity - a smart, funny, female led film guaranteed to make life feel better. Pitch Perfect director, Jason Moore, also directed Tina Fey and Amy Poehler comedy, Sisters. Elizabeth Banks went on the direct the film's sequel - Pitch Perfect 2. If so what do you think of this movie? Do you love it as much as I do? Or do you have trouble understanding what all the fuss is about?